Buy natural indigo produced in El Salvador, Central America, and help local farmers, whilst using high quality indigo to dye beautiful blues. This Salvadorean indigo has high indigotin content (now 45%, up from 37%) making it easier for you to achieve dark blues. The indigo plants are grown on a small farm that is committed to organic and fair trade production. The farm is reviving indigo cultivation, a traditional crop in that area since the 1800’s. El Salvador is now the main indigo producer in Latin America. The indigo dye powder is weighed and packed in a polythene grip-seal bag. The bag is then labelled and put in a second grip seal bag for extra protection. I then place the indigo dye in a small padded envelope and post it to you First Class. The Indigo vat needs spectralite or sodium dithionite and soda ash. Navigate to "Indigo" > "Indigo Dyeing" for instructions on how to dye with Indigo Dye. 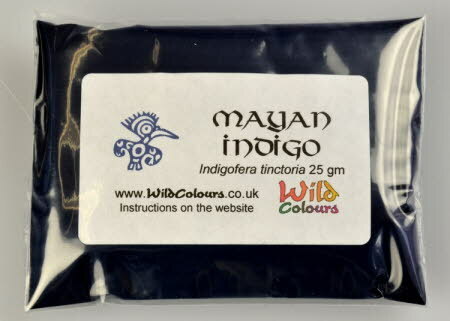 To read more about Mayan Indigo - navigate to "Indigo" > "Mayan Indigo". We hope you enjoy achieving beautiful blues with this exciting natural dye.